The University of Southampton is in the top 1% of universities worldwide. The university has 23,000 students of whom 6,500 are from outside the UK, coming from over 135 countries. We have campuses in Southampton, Winchester and Malaysia. We are a global centre for excellence in research and education and a founder member of the Russell Group, a prestigious association of 24 major UK research universities. Over 97% of our research environment has been assessed as ‘world-leading’ and ‘internationally excellent’ by the latest Research Excellence Framework 2014, an independent review of UK research. Our students report a high level of satisfaction with their experience of studying here, with 88% reporting that they were satisfied with quality of teaching and learning resources available to them and 93% in employment or further study 6 months after graduating. One of the areas in which we have a strong reputation is computer science and the development of technology for education, both for research and teaching. The university hosts the Web Science Institute (WSI), an important multidisciplinary research hub which is training the next generation of web researchers. WSI is led by Professor Dame Wendy Hall, one of the UK’s most influential and respected computer scientists. We have also won the Times Higher Education Awards for ICT Initiative of the Year two years in a row (2011 and 2012). The University has been one of the pioneers of MOOC (Massive Open Online Course) development and delivery within the UK, in partnership with FutureLearn. As one of FutureLearn’s first partners, we delivered our first MOOC in Web Science two years ago and since then, we have run over 10 courses, more than 28 times, reaching over 355,000 learners. We have run MOOCs in a range of topics including history, archaeology, oceanography and language teaching and learning. The University’s department of Modern Languages and Linguistics is consistently rated within the top 5 in the UK. We offer teaching in a range of languages and we are a thriving research community which is home to several internationally renowned research centres. We have a strong linguistics section and a large number of postgraduate students, mostly from outside the UK. Many of these students focus on technology-related research. The department includes a dynamic academic innovation unit which directs and coordinates a range of enterprise activities from our strong online learning portfolio, to a successful range of language-related events and commercial partnerships. We are very proud to be hosting EUROCALL. Staff and students within Modern Languages and Linguistics (MLL) regularly attend EUROCALL as speakers. We have a large number of postgraduate students who focus on CALL research and our staff are engaged in a range of CALL-related projects with topics including learning design, open educational practice, independent learning and the use of social media in language learning. MLL has a strong reputation for elearning and we have created a range of online courses including an online MA in English Language Teaching (a joint course with the British Council) and online Presessional and study skills – preparation courses for international students. Our online MA was one of the first distance courses offered by the university. ML hosts eLanguages, which is an elearning research and development group. This group is responsible for our online course provision in ML and also creates online resources and courses for commercial licensing and as open access materials. Other innovative elearning activities in the department include: the hosting of two Open Educational Resource repositories, the LanguageBox and the HumBox; hosting of the annual LLAS (Centre for Languages, Linguistics and Area Studies) elearning symposium, which is now in its 11th year; maintenance and training in the LOC tool, an online tool for the authoring of online materials (developed by the team in ML at Southampton), and the creation and delivery of a MOOC on language teaching and learning: Understanding Language: learning and teaching. This MOOC is delivered in collaboration with the British Council and is the University of Southampton’s largest such course having reached over 170,000 learners in six course runs. Staff within MLL also work with a range of international partners, including institutions in Russia, India and Mexico, to produce elearning programmes and materials. 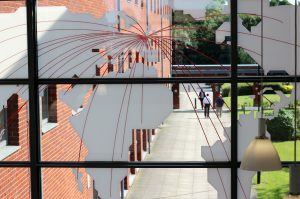 The Academic Centre for International Students (ACIS) is the University of Southampton's hub for language and cultural support for international students. It delivers courses including the International Foundation Year, Pre-Masters, English for Academic Studies, and Pre-sessional programmes. It also offers language and study skills support classes for international students to take during their studies at Southampton. The team within ACIS offer a range of online support, including running an online pre-sessional course, resources for business students, and online skills materials for independent learning.